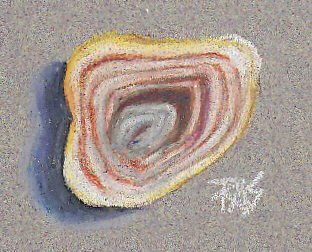 Small Polished Geode by Robert A. Sloan in Daler-Rowney oil pastels. Daler Rowney oil pastels are available at Jerry's Artarama or ASW and can probably also be found in some physical art stores besides Jerry's Artarama. I'm fairly sure I've seen it in person a few times. These are standard size round sticks with a firm, smooth texture. They are moderately opaque, though not the most opaque of the student oil pastel brands. The largest set of Daler Rowney that I found online is 24, but counting up the open stock colors available at Jerry's, I found 35 and the bottom of the page said 70 products were available. There may be a larger range or bigger sets available at other stores. Open stock availability and labeling pigments is one of the criteria for artist grade, but lightfastness is another and Daler Rowney does not claim lightfastness anywhere on the packaging or the description at Jerry's. The cardboard box my 24 color set of Daler Rowney oil pastels came in has a sturdy tray that slides out of a bright, printed sleeve. This is a little easier to work with than the Loew-Cornell sort of packaging with a styrene tray in a box with flaps, but a little less convenient than the heavy cardboard box with lid that comes off such as Erengi or Mungyo Gallery come in. I had a little trouble taking the first stick out of the tray the way it's set up. Texture was pleasantly smooth and creamy, what I would call firm rather than unworkably hard. I had good control of them working on Small Polished Geode on gray Canson mi-Tientes pastel paper. The white could have been brighter and more opaque, but I reached a limit of what the paper could take with it. Pigment concentration is in the student range judging by the opacity of the white. Price is at the high end of the cheap range, but they were not as dry and crumbly as some cheap oil pastels I've dealt with. A good binder formula and a decent chromatic range in the 24 color set with one gray, a gray-green, a skin tone highlight and the essential earth tones -- yellow ochre, reddish brown and deep brown. 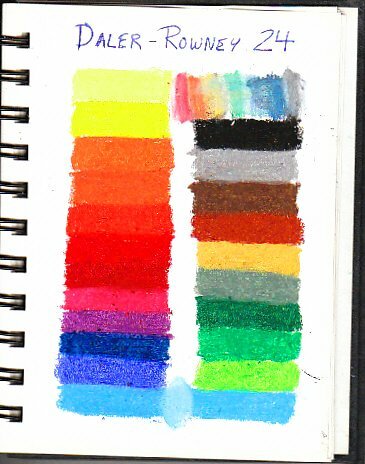 The colors not included in the set hint at a much larger range organized in a way typical for artist grade pastels -- pigment name colors mentioned by number with more than one tint, some other pigment colors mentioned by tint, many of which are included in this set. Color name, pigment and number are mentioned on the wrapper where the color name isn't the pigment: Carmine Rose has (Quinacridone) in parentheses. We'll have to see how these perform in next year's lightfastness test. I'll upgrade them into the Artist Grade category if the majority of their colors are lightfast enough to merit it. For now I think of them as high quality student grade, very suitable for sketching and studies. The two light warm blues at the bottom are different, the left-side one is Pthalo Blue Tint 2 and the right side Pthalo Blue Tint 1 -- very slight difference between the tints, not much at all. It is there in person but I have to look closely for it. I would have preferred a bigger gap, say a Tint 3 with a Tint 1 since the pigment is that strong.